Israeli Prime Minister Ariel Sharon and the leader of the opposition Labour Party, Shimon Peres, are inching towards forming a coalition government. Facing stiff opposition to the alliance from his Likud party, Mr Sharon warned of fresh elections if it failed to support the negotiations. Mr Sharon needs the support of Labour to implement his Gaza withdrawal plan, which Likud rejected in a May poll. Mr Sharon and Mr Peres held preliminary talks on Monday. Reports quote officials from Mr Sharon's office saying the negotiations were "held in a good atmosphere", but that no detailed discussion of the make-up of a new government had begun. BBC Middle East correspondent Paul Wood reports from Jerusalem that this could be the start of lengthy negotiations. He says Mr Peres will want an important job in any coalition, and Labour will want several things Mr Sharon will find it hard to grant. Labour is pushing for faster withdrawal from Gaza, currently planned for some time before the end of next year. The opposition party is also pushing for a bigger withdrawal from the West Bank, and direct talks with the Palestinians. In return, Mr Peres offers substantial parliamentary support for the Gaza disengagement plan, and stability for Mr Sharon's government. After the talks, Mr Sharon survived another no-confidence vote in parliament. Opponents and supporters both mustered 55 votes in the 120-member Knesset. The opposition needed 61 to topple the government. Ariel Sharon lost his majority last month when right-wingers angry at the Gaza plan withdrew from his coalition. the attorney-general's decision not to charge Mr Sharon over two corruption cases. 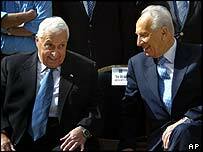 Both Mr Sharon and Mr Peres face strong opposition in their parties to the formation of a national unity government. Our correspondent says Mr Sharon's response to Likud resistance - to back him or face elections - are scare tactics, the minimum needed to cut through the toxic atmosphere of hostility in Likud towards any dealings with the opposition. One Likud central committee member said that Labour would be like a cancer eating into the party. Some Labour party members are opposed to what they see as propping up Mr Sharon's government and believe the party should be pushing for new elections. Likud and Labour formed a coalition under Mr Sharon in 2001-03, but the two parties fell out over funding for Jewish settlements built on land captured in the 1967 Arab-Israeli war. "Mr Sharon has to broaden the coalition or call an election"